Siloxacorr Hydrophobic | Advanced Polymerics, Inc.
Siloxacorr™ Hydrophobic Siloxane is a glossy weather and chemical-resisting top coat that exhibits outstanding long-term gloss and color retention. Siloxacorr™ is formulated with hybrid organic/inorganic resins and inorganic hydrophobic particles. Use Siloxacorr™ as a high-performance finish coat. It can also be used in conjunction with Allocorr™ Protective Ceramic Alloy to provide additional corrosion protection and impact and abrasion resistance. 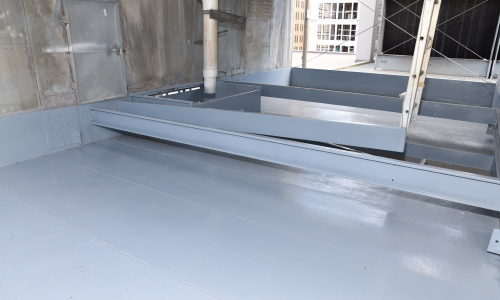 Apply Siloxacorr™ together with an epoxy primer or DTM for a superior water-resistant finish. It is ideal for structural steelwork, vehicles, trailers etc. Use Siloxacorr™ as a high-performance finish coat. It can also be used in conjunction with Allocorr™ Protective Ceramic Alloy to provide additional corrosion protection and impact and abrasion resistance. Apply Siloxacorr™ together with an epoxy primer or DTM for a superior water-resistant finish. It is ideal for structural steelwork, vehicles, trailers etc.